Hexanchiformes are the most primitive living sharks in the world. They only have one dorsal fin and have six or seven gills. Another characteristic of hexanchiformes is that unlike most sharks, they don’t have a nictitating membrane, which is a translucent eyelid that protects the eye. Some popular sharks in this order are the are the @frilled shark and the @sixgill shark. 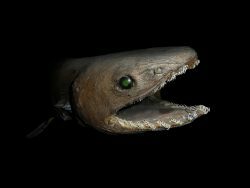 The African frilled shark is a rare deep sea shark with a long snake-like body and a broad, flattened head. They are dark grey in colour, but are covered with a thin membrane that makes them seem brown. They occur… read more. Bigeye sixgill shark is a rare deepwater cow shark often been misidentified as the larger bluntnose sixgill Shark. Very little is known about this shark, with a poor knowledge of its distribution and no knowledge of population trends. Adults are usually… read more. Bluntnose six-gill shark are a widely distributed species of cow shark. They’re found in the temperate and tropical seas of the continental shelves of Pacific, Atlantic and Indian Oceans. It occurs from the surface to as deep as 2,000 m…. read more. The Broadnose sevengill shark is a large seven-gilled — the most gills in any shark — cowshark with a wide head and short, blunt snout. They are related to sharks that lived in the Jurassic Period about 300 million years… read more. Behaviour and Interesting Facts: The Frilled Shark is a deep-water shark. It’s been called a living fossil due to its similarity to prehistoric sharks. Its elongated body makes it look like a mix between an eel and a shark. Its… read more. The sharpnose sevengill shark is a relatively uncommon species of cow shark found in deep water all over the world. It is an uncommon species but it’s widespread. It feeds on pelagic fishes, squids and crustaceans. The maximum size it… read more. Do you have images or videos of Cow and Frilled Sharks – Hexanchiformes?